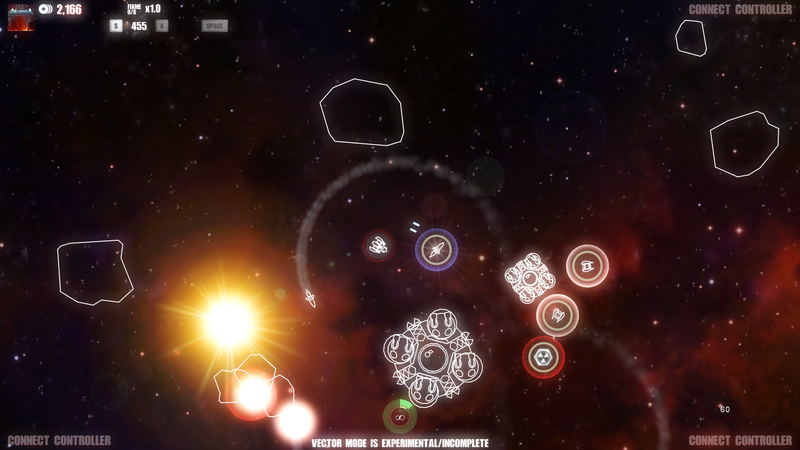 Early Access V1.2.4.2 — Congrats on the Weekly Scores & Vector Mode Update! Hello everyone! Thank you to all the players that have tried out some of the recent updates and posted scores to the new Daily/Weekly/Monthly leaderboards. It’s been about a week since the update to add Daily, Weekly, and Monthly leaderboards and I see both some familiar names as well as some new ones. What do you think so far, yeah or meh? Here’s the top scores for the week!! And for the month of March (partial month)! 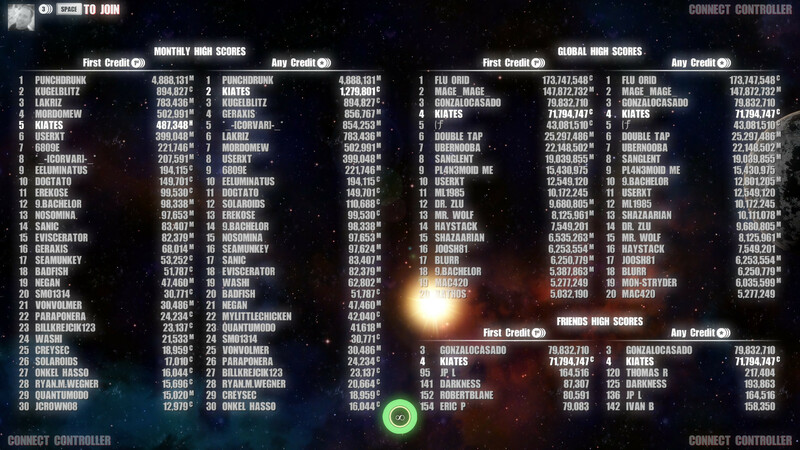 Speaking of leaderboards. I think it would be fun to have a speed run leaderboard. For the current Campaign it would be through Level 10 possibly with intermediate ones for each level to track progress, and for Free Play mode it would be through a certain number of waves possibly with intermediate ones as well. What do you think? In other news, work continues on the experimental Vector mode. I’ve converted more of the graphics and have been playing with simulating the look of a real vector display. 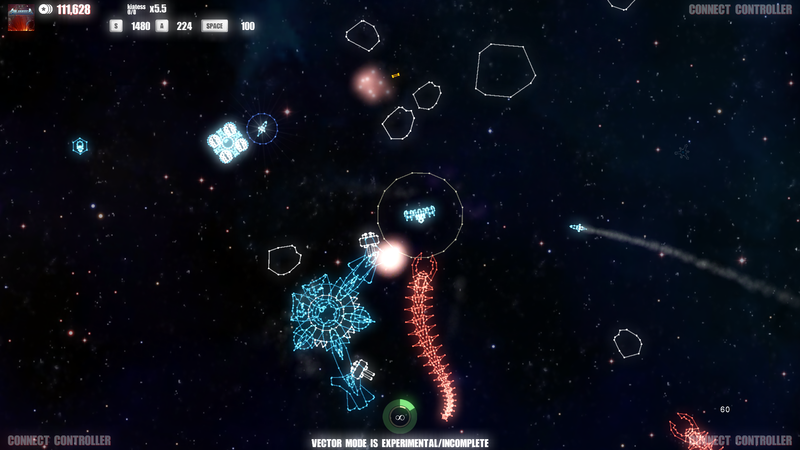 Here’s what it looks like with the Asteroids Deluxe colors — as available in this EA V1.2.4.2 build. This still picture doesn’t really do it justice, as the flicker effect adds a nice touch of authenticity. I’m also playing around with adding color into to the mix. Here’s a early sample of what it’s looking like so far. What do you think? I’m thinking of making options to tune the vector mode to your liking. If I do it would probably include an adjustment for full-color vs a single color, line thickness, beam intensity, and flicker. Would you rather see these kinds of detailed options, or just a high level Monochromatic/Multi-color option where I pick the settings? That’s all I have for this update as far as the bigger changes, but there have been several other smaller tweaks, so see the patch notes below. Thank you for supporting me on my journey to try and make the Best Asteroids Style Space Shooter. If you ever want to chat about Solaroids with myself or other players, or brag about your top scores and share tips, join the Solaroids Discord Server. It’s quiet there now, but maybe you can help change that! I’ve also created a dedicated Early Access Page filled with, gifs, links, and a place where you can sign up to be notified at full launch. Cycling leaderboards now cross fade as a transition. Alternate main high score display layout with Daily/Weekly/Monthly tables at the top and Local scores at the bottom. Always show Daily scores first at the end of a game. Daily leaderboard will show your score for at least one day, up to two if your really early in the day. Enhance vector mode to emulate an Asteroids Deluxe style look. Tweak background transparency for Stage 1 graphics. Suppress controller vibration when a player is not actively in the game. Fix potential issue when forfeiting. Restart soundtrack when entering the actual game. More updates to German translations. Fix issue with local leaderboards not refreshing immediately when cleared. Fix issue showing daily/weekly/monthly rank. Solaroids is available on Steam Early Access and is still being actively developed by Chad Yates as part-time Indie game developer. Come try out the free Demo, join the Community HUB on steam, or join the ranks of brave fighter pilots defending the solar system and competing for high scores and prestige! Early Access V1.2.4.1 – Daily, Weekly, and Monthly Leaderboards are live! Hello players! Round one of leaderboard enhancements is ready for prime time. Solaroids will now show Daily, Weekly, and Monthly scores. During the EA V1.2.4.0 update last week that released the early version of the Vector mode, I also put in some behind the scenes work to start collecting scores for some additional leaderboards. This includes Daily/Weekly/Monthly boards that are like the First Credit and Any Credit boards that are already established, but also starts recording scores for Control Style specific leaderboards (not exposed yet in-game as I’m working out details on where and how I want to display them). 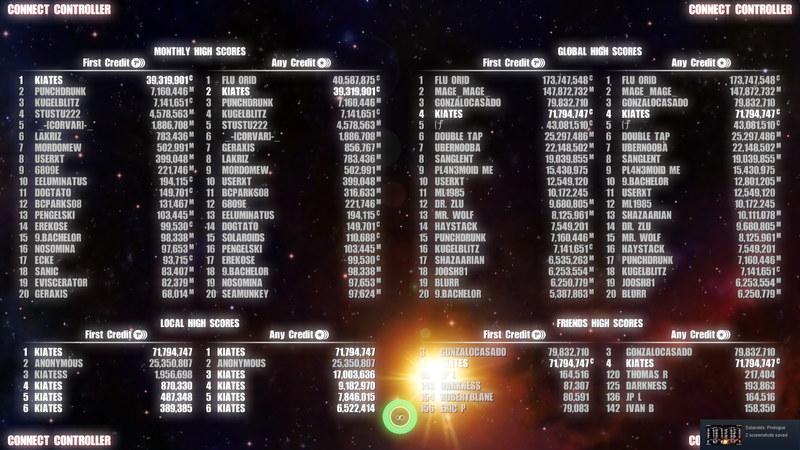 Anyway, this update allows the Daily, Weekly, and Monthly First Credit / Any Credit leaderboards to be displayed in game. They show up on the left side of the main leaderboard display where the local leaderboards show. That area now cycles between Daily / Weekly / Monthly / Local boards, switching every 5 seconds. 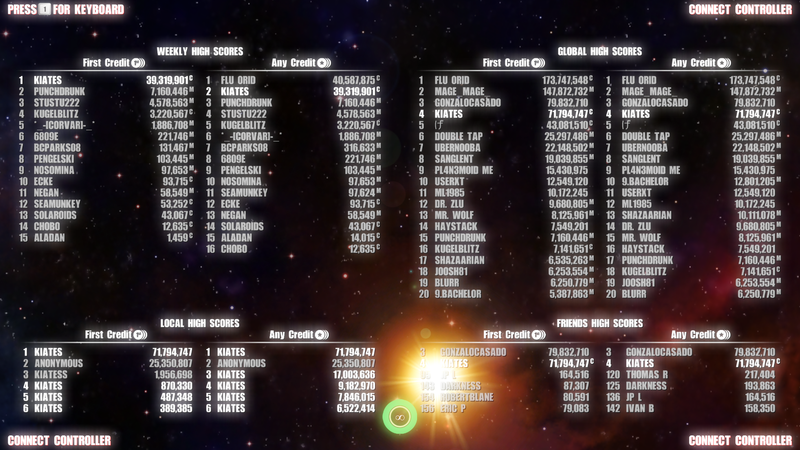 I hope you enjoy the new boards, and stay tuned for more tweaks related to leaderboards soon. Daily, Weekly, and Monthly leaderboards. Updates to German translations. More coming soon. 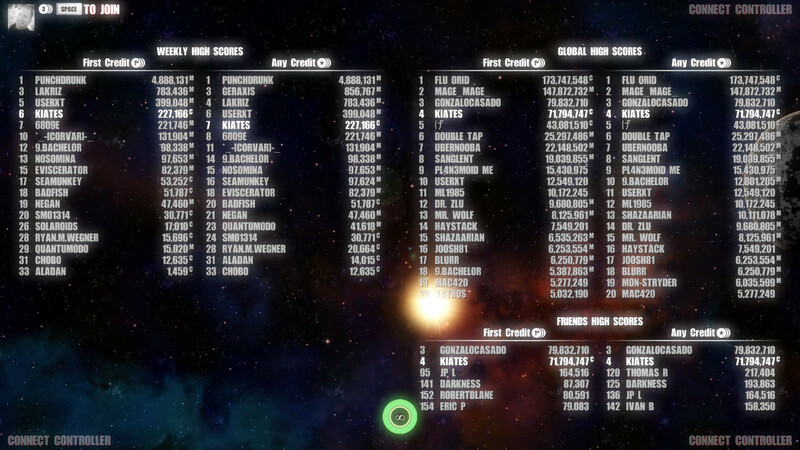 Per player leaderboard displays now correctly change between First Credit / Any Credit scores while playing. Improve handling of statistic and leaderboard refreshes. Early Access V1.2.4.0 – Experimental Vector Mode! Hello everyone! A little update with some new features mostly around options and to give you an early glimpse of the work-in-progress on the new Vector mode. Yip, I couldn’t resist getting your feedback, so I exposed an option to change the theme between the normal modern vector illustration style graphics and a more raw classic vector style. It’s still very much a work-in-progress so be gentle. I still have to do work to swap out more shapes/symbols, particle effects (explosions/missile trails), fonts, and of course the main title, but I’m interested to hear what you like and don’t like with the direction. Eventually I want to support additional themes too, so I can put in a nod to my old workhorses, the Commodore Amiga and C64, and hopefully some other classic systems as well. You can change the theme from the Effects menu, or for the brave, you can switch while in the heat of battle with the T-Key or DPad-Up, which are the default controls mapped to the feature. There are also a few smaller updates focused on some usability enhancements requested from players and Youtubers. You can now fine tune the sensitivity of the thumb-sticks and triggers for the supported game controllers. This shows up as Thrust/Rotation Sensitivity options under the Controls option menu. In addition, you can also tone down the power of the thrusters if they’re just to much for you to handle using the Max Thruster Power option. It’s also fun to dial it down just for more deliberate thrusting experience and a different feel, but unfortunately, if you dial it down too much, you’re bound to take a beating from random debris and bullets!! Enable experimental Vector mode. Note this is really early-early-access. It can be turned on either from the Theme option under the Effects category, or by pressing the DPad-Up button or T-Key if keyboard is being used. The control used can also be reconfigured like other controls per Control Style. Max Thruster Power option – Adjust the maximum thrust on a player by player basis. This is both useful to tune to your comfort level, and when taken to the extreme, makes for some fun times trying to change trajectory to avoid incoming debris! Thruster/Rotational Sensitivity control options – Adjust the sensitivity of the controls used for thrusters and rotation when assigned to analog controls like thumb-sticks and triggers. At 100% it will behave as it has, while at 0% most of the control will be at the end of the pull/push, and at 200% most of the control will be at the start of the pull/push. This is also per player. Display version and EA disclaimer on the in-game option screen. Add Solaroids logo to the in-game option screen. Use machine based-translations, denoted with a (*), as stand-ins for text that hasn’t been proofread/localized by a native speaker. Yes I finally pulled the trigger on this one and actually put the machine translations in until I can get the real ones sync’d up. Allow the viewing and configuring of player options and controls from the main menu, not just the in-game pause menu. 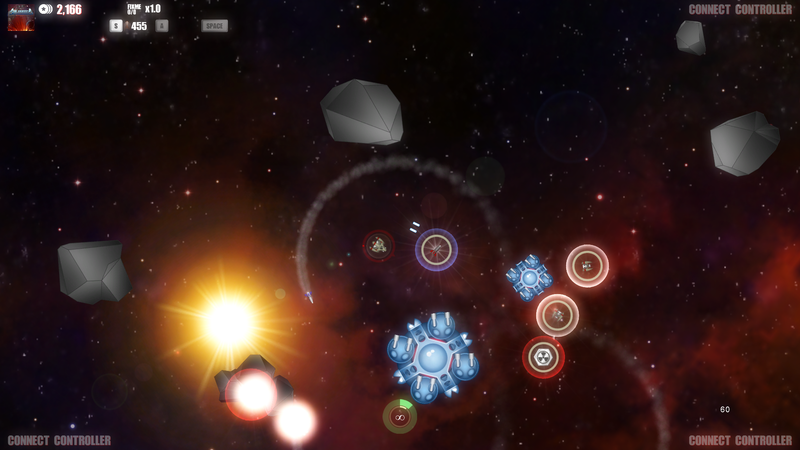 Move Autofire and Aim on Fire options from the Gameplay category to the Controls category. They are now configurable per player instead of global options. Fix title graphic style/size when starting up under a non-English locale. Fix regression in camera handling at the edge of the arena when Seamless Wrapping is off.